In the summer of 2009, a combination of organic growing and home gardens have, ironically, inspired what is beginning to look like a big environmental mess. As people have become enamored of fresh-off-the-vine tomatoes, millions of us are obsessing about the tomato and potato blight that's struck the Northeast US, causing tomato prices to go up by 20 percent. Meanwhile, farmers are agonizing over whether to spray fungicides, and lose organic certification -- or face the loss of an entire crop of tomatoes. Added into (and helping to fuel) the mix is Michelle Obama's vegetable garden, which was so inspiring that 43 million households -- up 20 percent from 2008 -- are growing veggies in the U.S. this year. It's something else that this blight seems to be the fault of well-traveled tomato plants. Oh, the unusually wet June weather is also to blame, as are monoculture farms which grow dozens (or hundreds, or thousands) of acres of the exact same plant. But mostly, it's the fault of trucks full of tomato seedlings traveling the Eastern interstate highway system. The late blight is a fungus that attacks tomato and potato plants, typically late in the season. In a few short days, its brown patches, black spots, and gray downy fungus can slay an entire field of tomato or potato plants. Given that fungal spores can travel up to 40 miles by air and spread when plants are wet, it is all too easy to imagine how a minor outbreak can turn into a major disaster. For comparison, it's worth noting that the infamous Irish Potato Famine was caused by a strain of Phytophthora infestans. That the late blight will strike eventually in a season with extra quantities of rain is almost a given; farmers who grow susceptible varieties expect it at some time, and many farmers spray fungicides on a weekly basis. Sadly, these measures slow, but cannot eradicate, the fungus. The late July attack is exacerbated by home gardeners, specifically, ones who purchase seedlings from major retailers like Home Depot, Lowe's, and Wal-Mart. Generally, big retailers get their seedlings from warm nursery farms in the Southeastern US, and are slow to recognize and pull seedlings that are infected. A plant pathologist consulted by Dan Barber for his op-ed on tomato blight said that she saw blight on tomato seedlings at a major retail outlet, and alerted an employee. He couldn't pull the plants without his supervisor's authority; it wasn't given. She came a week later and found the blight-infected tomatoes still there. Writes Barber, "With tight coupling - lots of tomatoes grown in one place, say, or distributed by one large retailer - failures in one part of the system can quickly multiply." It's like salmonella in peanut butter, E. coli in ground beef. The disease outbreak starts in just one plant (or farm or slaughterhouse), and is quickly distributed all over the country. By the time the infection is detected, it has gone so far and travelled so well that it can't be stopped and must simply be watched as it runs its course. Barber offers a few solutions: one is to remain open to the development of disease-resistant strains of fruits and vegetables, especially those that are regionally selected for idiosyncratic growing conditions in various areas. Another is for the government to more actively campaign through its agriculture extension services to contribute crop wisdom to newbie farmers. Apprentice farmer Mary Kathryn Wyle, writing for Civil Eats, praises the business plan of CSA (community supported agriculture), in which customers pay upfront and share in the bounty. She tells the story of a farmer who pulled his blight-infected plants and put beans and brussel sprouts in their place. Barber mentioned one very simple solution that reflects the spirit of the "locavore" movement and the wisdom of the millenia of sustainable agriculture that preceded our fossil-fueled modern economy: "grow local." Seedlings trucked thousands of miles, he points out, are just as bad as tomatoes trucked thousands of miles: you're blinding jumping into our highway-based food system while still doing most of the work. If those 43 million American gardeners had all either grown their own tomatoes from seed or purchased tomato seedlings from local farmers, the blight wouldn't have spread nearly as early, far, or destructively as it did. 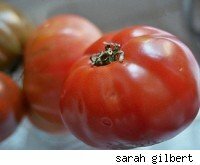 Want to stop the great Northeast Tomato Famine? It's easy. Grow local.